Phwoar, remember Killzone 2? The PlayStation 3 exclusive hit with a bang back in February 2009, and it was the first time Guerrilla Games really blew people away with its mastery of Sony's tech. The Dutch developer would go on to craft the gorgeous Horizon: Zero Dawn on PlayStation 4, but let's just take a moment to remember the gritty, immensely intricate splendour of Killzone 2. As highlighted in a great new video from those eggheads over at Digital Foundry, Killzone 2 still holds up incredibly well today, ten whole years after its release. From the brilliant lighting effects to all of the tiny little details, the game was an absolute visual feast back in 2009. We remember it blowing our minds at launch, and its oppressive atmosphere remains tangible even now. It was such a weighty, physical shooter -- it really stood out from the twitchy competition that flooded the PS3 era. Honestly, we'd be up for a cheeky PS4 remaster. Killzone 2 never gets the praise it deserves. All because Guerrilla got sandbagged by what I call "Old Sony" but it still remains for me the only FPS where I felt like I was in an actual warzone. One of my favourite shooter campaigns ever. It's all good till you realise you're 2 foot tall. 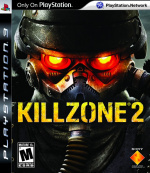 I've never been into online FPS games but for some reason I couldn't stop playing Killzone 2's multiplayer. Great game. @ApostateMage It's the sound effect when you get a kill that's the secret. @get2sammyb That was an incredible noise! I had it as a notification on my mobile at the time. The online was amazing, I was lucky enough to get the top 3 ranking of the week trophy which was hard at the time because there were so many good players out there! @get2sammyb Ha! That kill chirp was ever so satisfying. Still my favorite multiplayer shooter. Loved the class based gameplay before that was really a ‘thing’ on consoles. Would kill for a remake that doesn’t change a thing (well maybe add those sweet K3 jet packs). Very differently paced from MW2 and it felt great. I remember beating it on elite difficulty, never again! This was back when trophies were pretty new and I was hooked on it as a kid. The amount of hours I've spent chasing these ridiculously hard trophies, now I just play for fun and only go for trophies if they're actually enjoyable to obtain for me. I loved the 'weight' of Killzone 2 - felt much more realistic than any shooter before or since. that kill chirp never got old, even after 70,000 times. think it's probably too late in the day for a cheeky remaster, even though i'd be tempted. that warzone mode was something else... shadow fall was a bit of a misstep, would like to see them combine the structure of horizon with the oppressive atmosphere of helghan and the weightiness of the combat in a reboot. I enjoyed the game but I couldn't stand the moronic characters. But Resistance 2 and KZ2 were two of my very first PS3 games so carry a lot of great memories. It's just unfortunate I found the killzone franchise to be so very boring, always preferred Resistance myself. Killzone 2 was a fun time. I don't have a copy of the 2nd game anymore, only 3 and Shadow Fall. A relatively entertaining retrospective on "Killzun 2" there, even if I didn't understand half of it (seriously, they're making most of those words up to sound clever, aren't they?). Makes me wanna replay it, and Killzone 3, which I preferred. Killzone 3 with the sharpshooter was the best! (The story still sucked though imho) They should do a psvr remaster with aim support! Metal Gear Solid 4 looks mind blowing as well to this day. Killzone 3 looks amazing as well & most of all the playability it's just not power. I loved killzone & Resistance I would love to see a remake of them both, Killzone 2 was amazing when it came out being very unique game come paired to other FPS of the time,I played the it online to death. Could anyone have imagined this coming from the same studio that once made “Shellshock Nam”? Thats actually really incredible! Looking back after all this time only emphasizes how ahead of its time it was. Still though. It was one helluva game in every way a game cane be. I played it through a couple of times and loved the AI team co-op mode.